Synopsis: Darcy's as hot as he is talented...Fast music, powerful beats, and wild reputations-on and off stage-have made virtuoso guitarist Fitzwilliam Darcy's band into rock's newest bad boys. But they've lost their latest opening act, and their red-hot summer tour is on the fast track to disaster. Now Darcy and bandmates Charles Bingley and Richard Fitzwilliam are about to meet their match... But she's about to rock his world...Enter Elizabeth Bennet, fiercely independent star of girl-band Long Borne Suffering. Elizabeth, her sister Jane, and friend Charlotte Lucas have talent to spare and jump at the opening band slot. Elizabeth is sure she's seen the worst the music industry has to offer. But as the days and nights heat up, it becomes clear that everyone is in for a summer to remember. 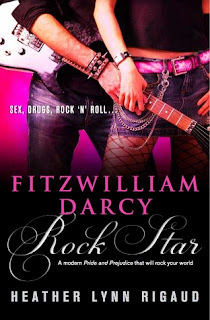 Review: 3.5 Stars - Fitzwilliam Darcy, Rock Star by Heather Lynn Rigaud is a retelling of Austen’s Pride & Prejudice with a twist. Retellings have been around for awhile of this classic and adding the rock star twist was a fun and entertaining read. The story was fun, characters engaging and held hints of the original characters. While I did enjoy the story, I felt it was somewhat on the long side, which took away from it a bit for me. I’m a music junkie, have been since I can remember and I’ll be honest that was the main draw in reading this title. To get a chance to read such a classic wrapped in modern times, swaddled in music was just the hook I needed in reading and reviewing this one. I liked the added touches such as the lyric’s mixed in. Those gave the characters a bit more depth and added another layer to the situations they were facing at the time. I also liked how it felt as if each of the characters had a chance to tell more of their story, giving each of the characters bigger voices in this adaption. I felt this was perfect for Rigaud’s version. All in all, I did enjoy reading this version and the music side of this telling was what had me hook line and enjoy in this. Fitzwilliam Darcy, Rock Star is a fresh take on Austen’s famed and beloved characters, set in the wild world of the music industry bringing a highly entertaining aspect to this modern retelling. If you love the two, this mash up is for you. Enjoy. I really have been wanting to read this, it looks like one of those hidden gems to me and your review is encouraging me to get it!! This sounds intriguing. I think I would like this.